Grafton – Grafton taxpayers have gotten an early holiday present. 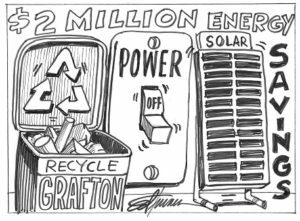 According to officials, the town has saved nearly $2 million thanks to a number of programs related to recycling and energy aggregation. Grafton Energy Choice residential program participants are now saving more than 3.5 cents per kWH compared to National Grid’s Basic Service price. That means a savings of as much as $27 per month per household when compared to National Grid. Additional recycling programs and the implementation of solar agreements to generate additional tax revenue have also brought additional savings to taxpayers.